A Boeing B-52 Stratofortress strategic bomber from the United States Air Force (USAF) Andersen Air Force Base in Guam performs a fly-past during an aerial display at the Singapore Airshow in Singapore February 14, 2012. Recent U.S. bomber flights over the contested South China Sea could boost the security of Southeast Asian countries that claim the waterway as Washington’s planes help check any maritime expansion by the dispute’s major player, China. 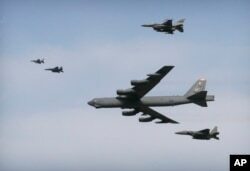 Analysts believe the periodic B-52 bomber flyovers, including two last month, would give Brunei, Malaysia, the Philippines and Vietnam a layer of protection against Beijing, which is pressuring the maritime sovereignty claims of all four in the resource-rich South China Sea. Stratofortress bomber aircraft “conducted operations” in the South China Sea and Indian Ocean September 23 and 25, the U.S. military’s Pacific Air Forces said in a statement last week. The B-52-model aircraft had set out from Guam for a “routine training mission,” the statement said. “Southeast Asian claimant countries should feel encouraged and inspired by the flyovers, which demonstrates U.S. dedication and keenness on countering China’s behaviors in the region,” said Yun Sun, East Asia Program senior associate at the Stimson Center think tank in Washington. China’s military protested the move last week as “provocative” and called for follow-up action. China claims about 90 percent of the sea as its own, giving it a lead in access to prized fisheries, fuel deposits and marine shipping lanes. The four Southeast Asian countries and Taiwan claim all or parts of the sea but cannot vie with China’s military might. Washington, which does not claim the 3.5 million-square-kilometer sea, insists the South China Sea stay open to international navigation. The U.S. government periodically sends military aircraft in or around the sea, adding to passages of naval vessels called “freedom of navigation” or FONOP exercises. In 2015, China protested two American B-52 bombers near the sea’s Spratly Islands as “a provocation that should be prevented,” Beijing’s official Xinhua News Agency said. In June, the U.S. Air Force flew two B-52s to the same place from a base in the Indian Ocean, the Air Force Times online reported then. A U.S. Air Force B-52 bomber flies over Osan Air Base in Pyeongtaek, South Korea, Jan. 10, 2016. The bomber flew low over South Korea on Sunday, a show of force from the U.S. as a Cold War-style standoff deepened between ally Seoul and North Korea. Washington is using the flights as a “pressure” tactic over the two-way trade dispute, said Alan Chong, associate professor at the S. Rajaratnam School of International Studies in Singapore. The U.S. government has placed import tariffs on $250 billion of Chinese goods this year, part of a campaign this year by President Donald Trump. The U.S. bomber missions also warn China against over-militarizing the sea, he said. Southeast Asian countries have tended to stay quiet as Beijing has placed missiles on islets, held naval drills and considered nuclear power stations. Those moves in the sea over the past year follow large-scale landfilling to make small islets ready for new infrastructure. China also rejected a 2016 world arbitration court ruling, filed by the Philippines, against its legal basis for claiming the sea that stretches from Hong Kong to the island of Borneo. Beijing cites historical records to back its claim. Some of the countries now accept aid from China, further muting any criticism. Vietnam is seeing an influx of Chinese tourists, while the Philippines is due to get billions of dollars in Chinese development aid. Officials in the United States said earlier this year they want Vietnam to buy more U.S. weapons. In July, two U.S. ships and an aircraft carrier held joint exercises with the Philippines in the South China Sea. Analysts say the U.S. military presence can deter China from taking more islets in the sea. “These sorts of bomber flights, they are not exactly new, they have been carried out for quite some time, so in a way it is meant to impress upon not just to China, but also to the other potential actors around the area of the U.S. resolve to be present in that area,” said Collin Koh, maritime security research fellow at Nanyang Technological University in Singapore. The U.S. Air Force will not roll back its B-52 flights and could increase them, Koh added.